I have been extremely keen to try out the Plymouth Branch of Le Bistrot Pierre since it opened at Royal William Yard recently. The Plymouth restaurant is one of only ten branches in the country, and they prefer to call themselves a “family of individual restaurants” rather than a chain. I’m unsure how many restaurants constitute being a chain, but we are clearly not talking about McDonald’s here. Le Bistrot Pierre serve a range of French cuisine, and the good news for coeliacs and those following a gluten free diet is that they have a dedicated gluten free menu. It’s good to see that their website also clearly states that they have been working closely with Coeliac UK. The Royal William Yard is becoming something of a gluten free hot spot. 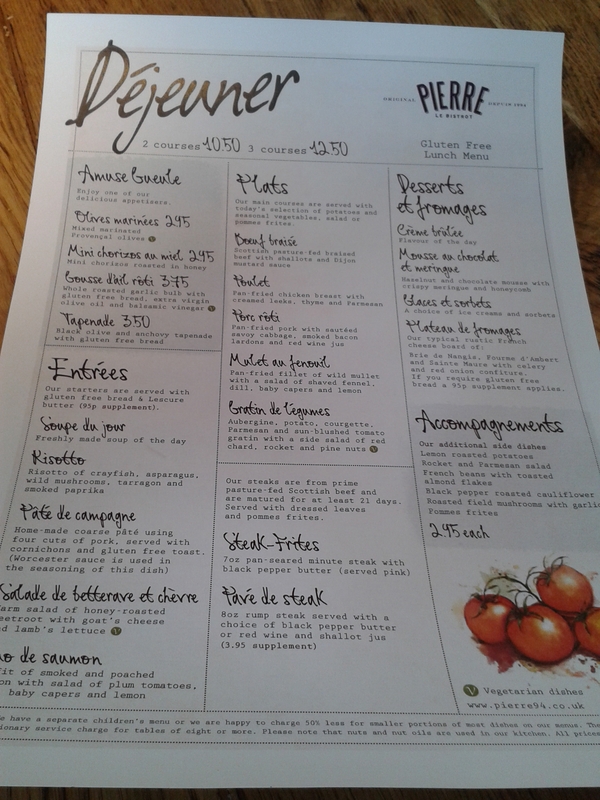 Le Bistrot Pierre is joined by Rover Cottage, Las Iguanas and Prezzo which all have gluten free offerings. Friends of Gluten Free by the Sea Plymouth Greengrocer and Let Them Eat Cake can also be regularly found at the Sunday Good Food Markets. I’d heard good things about the food from several people, and when I was looking for somewhere to go out with my dad for lunch this week it seemed a perfect opportunity to give Le Bistrot Pierre a try. There is a dedicated lunch menu, offering two courses for £10.50 and three courses for a bargain £12.50. Evening meal prices whilst much more expensive are still reasonable in my opinion. So on arrival at the restaurant we were seated and I was promptly presented with the gluten free menu. I had a quick snoop at my dad’s menu to see what I was missing and the good news was that it was hardly anything! The standard menu had a burger option and a few extra desserts and that was pretty much it. Whilst we were pondering the menu some bread was delivered to the table. I asked the waitress if it was gluten free and she informed it was not, and promptly went off to fetch some. This was toasted and arrived a little while later with the starter. 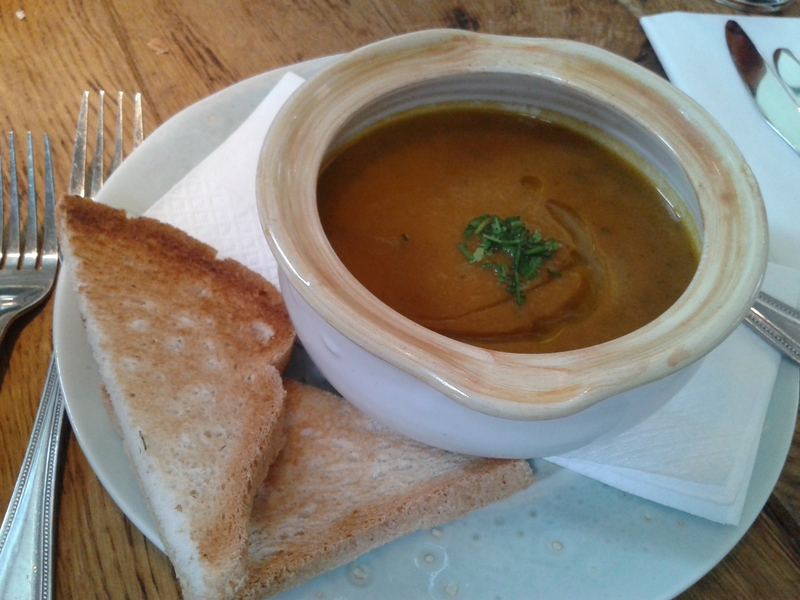 To start I went for the soup of the day, which was carrot and coriander, which was served with gluten free bread. There was a 95p supplement for this which was my sole niggle of the day, though the overall value of the meal was fantastic so I couldn’t really complain. Le Bistrot Pierre have confirmed the bread is toasted under a grill in a clean tray to avoid contamination. The soup was lovely and the bread was pretty good too, a decent start to the meal. Dad went for a crayfish risotto which was also on the gluten free menu. creamed leeks, thyme and Parmesan. There was a choice of fries, vegetables or a side salad with this. 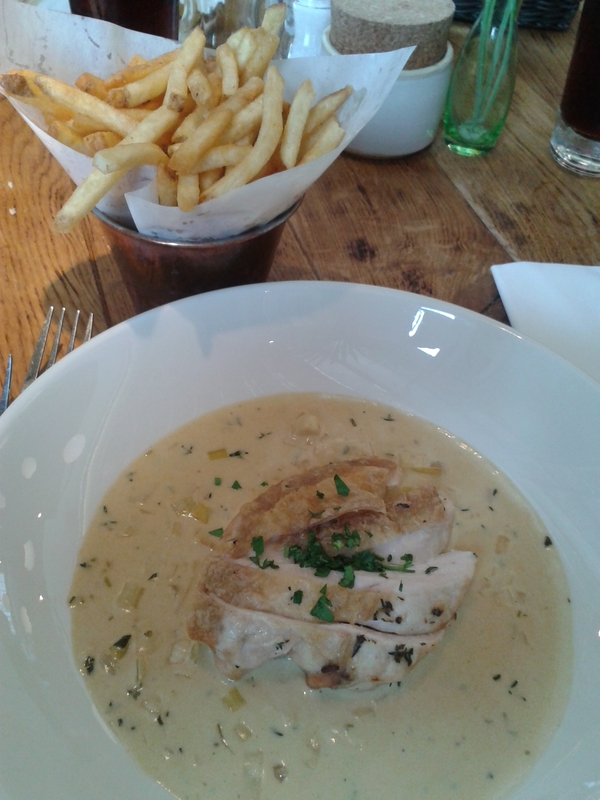 I went for the fries as I find it is always hard to say no when given the chance of chips as a coeliac! The chicken was cooked perfectly and had the skin on to enhance the flavour. 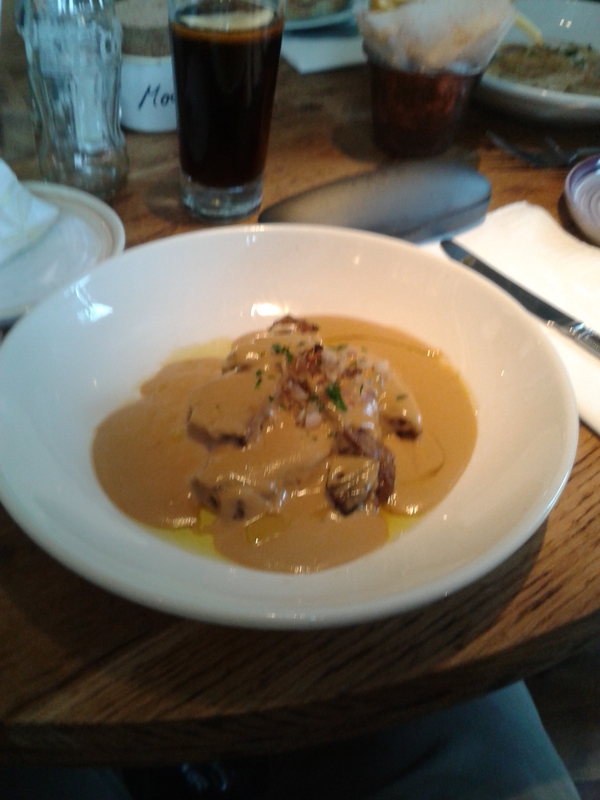 The sauce was excellent too and I really enjoyed the dish. Meanwhile dad had gone for slow-braised Scottish pasture fed beef with shallots and Dijon mustard sauce (also available on the GF menu). Whilst my main was great, I have to say I was suffering from a bit of food envy as dad’s braised beef looked amazing, as did the seasonal veg that he had chosen rather than the fries. We pondered whether to have a dessert but it was only going to be an extra £2 each for another course so it seemed rude not to, and as dad pointed out I have readers to think about! 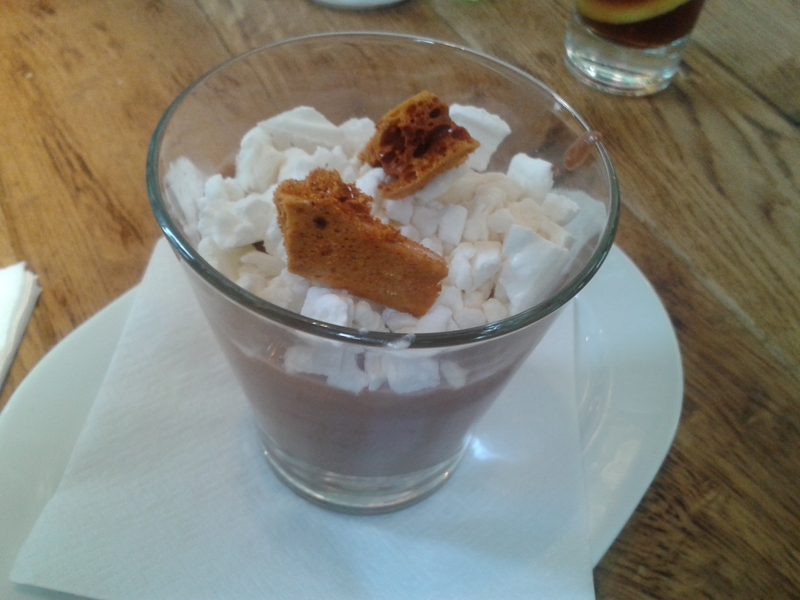 I kept it light and went for the hazelnut and chocolate mousse with crispy meringue and honeycomb. This had a great rich chocolate flavour and the crunch of the meringue and honeycomb provided a nice contrast to the texture of the mousse. I won’t tease you with a description of dad’s gluten filled finale, but suffice to say he did not struggle to polish it off! We both really enjoyed the meal. The service was great, the restaurant was nicely decorated and the Royal William Yard really is a great setting. For £12.50 each we were both thoroughly impressed with all aspects of the meal, and this really was fantastic value. We’ll definitely be going back in future. If you live in Plymouth or any of the other locations that have a Le Bistrot Pierre, I can thoroughly recommend you give it a try. It has been great to hear that products from two local gluten free producers recently reviewed on this blog are now being stocked at Plymouth Greengrocer in Plympton. Sweet and savoury items from Let Them Eat Cake and delicious puddings from Traditional Puddings are now available in store. I personally think it’s fantastic to see so many local gluten free products available to buy in one place. This Saturday Plymouth Greengrocer are holding a gluten free open day where there is a gluten free Chinese cooking demonstration, a chance to taste samples of their gluten free foods and also enter a competition to win £30 of gluten free products. I will be popping along and am really looking forward to the event. Some of you may remember that I brought you news that Mexican and South American influenced restaurant chain Las Iguanas were set to open in Royal William yard. The opening has been held up by red tape, but Las Iguanas have finally been granted planning permission and have now pencilled in an opening date for May 1st “if all goes according to plan”. You can view their gluten free menu here. The group have now launched Plymouth focused Facebook and Twitter pages to enable you to keep up with progress. Another restaurant chain coming to Royal William Yard is Le Bistrot Pierre. I previously reported news that they were set to open this month, however they have informed me that they are now working towards opening the week commencing 18th March. More info on their gluten free options here. One thing that coeliacs and people on a gluten free diet always seem to crave is a good old pizza. I was happy to read this week that the Prezzo chain now have gluten free pizza available in all of their UK restaurants. I was even happier to discover that tucked away in Royal William Yard we actually have a Prezzo in Plymouth. I see that Coeliac UK have commented on the story linked above, so hopefully Prezzo have done their homework with regards cross contamination issues. Has anybody tried the Prezzo GF pizza yet? Please comment below with your verdict if you have. There is also news of another bistro opening at Royal William Yard in the form of Le Bistrot Pierre. The restaurant will offer French dishes, and more importantly seem to take gluten free extremely seriously. There is an impressive gluten free page on their website, and the food sounds delicious with a good range of gluten free choices. I’m looking forward to trying this one when it opens in Februrary 2013. Again good to see they have been working closely with Coeliac UK. Royal William Yard is fast becoming a gluten free hot spot. Le Bistrot Pierre will join the River Cottage Canteen and the soon to open Las Iguanas as offering great gluten free options at RWY. Combined with the Prezzo news above I think I’d quite like to move there! Not all good news on the Plymouth gluten free eating out front unfortunately. News recently that La Tasca has now closed with the loss of thirteen jobs. Offering Spanish Tapas with clearly marked gluten free options on the menu and even gluten free beer, this was on my to do list but I never made it to try. There are many other branches throughout the country though, and it’s always good to be aware of gluten free friendly chains when eating away in strange places. 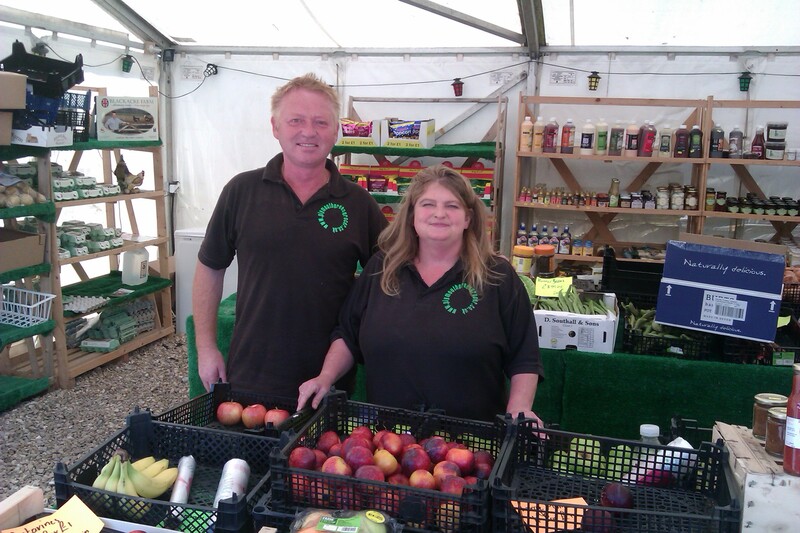 Julie and Mark at Plymouth Greengrocer are continuing their amazing work supporting the gluten free community in Plymouth. They seem to be adding more gluten free products weekly now and if you are living gluten free in Plymouth I highly recommend you pay them a visit. Recently announced new products from the Foodamentalists are now in store, and the shelves are now brimming with the coeliac community’s favourite Pom Bear crisps. This week has seen the addition of delicious GF cupcakes from a Piece of Cake Bakery, products from the Warburtons gluten free range and gluten free sausages and sausage meet from the local Paul Bray & Son Butchers. Also recently added are gluten free brownies from Peck & Strong, and I am pleased to hear that hot chocolate stirrers from my friends at Sweet Devotion are soon to arrive on the shelves. A fantastic range of gluten free products now available so make sure you stop by and take the chance to support many local businesses.